If youre thinking about purchasing a toaster oven, the Cuisinart toaster oven might be worth a closer look. With all the fancy gadgets on the market, the simplicity and speed of toaster ovens is a great advantage especially if youre constantly on-the-go. For green homes, toaster ovens require less energy, and they dont make your whole house hot! Better still, theres no question that toaster ovens are easier to clean than conventional ones. You may think that toaster ovens are out of style, but as a parent its a great way to introduce cooking to your kids with little worry. This toaster oven has a lot more interior space than you may think (it holds a 12 pizza! ), and it doesnt take up loads of space in the kitchen. Even if you have a good oven, having a toaster oven like this lets you warm up small items and make side dishes for special events when other cooking spaces are full. Visually the Cuisinart toaster oven creates a very nice impact in your kitchen. It comes in a stainless steel finish with chrome accents. The touchpad controls are clear and versatile (including the ability to defrost). The interior is brushed chrome too  making clean up a much simpler matter than it is for some other toaster ovens. When I think of a toaster oven, I dont usually consider it a major investment. This particular toaster oven, however, retails for $325.00. To be honest, at that price I probably wouldnt invest in it. However, when its on sale for $150  were getting closer to an affordable addition to your household appliances. Additionally, stainless steel finishes usually run on the higher end of a line, and I do like that finish a LOT. 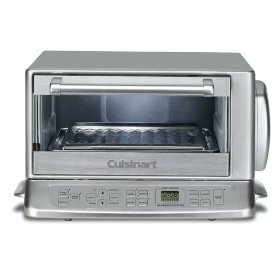 Reading around the web, the Cuisinart toaster oven is getting really positive feedback. People like the fact that it warms up quickly and notifies you when the temperature is just right. They also appreciate the size externally and internally and the overall ease of cleanup. The performance of this toaster oven seems to be spot-on. From defrosting and reheating to broiling and toasting, the oven maintains a proper temperature and delivers excellently cooked food. The only small complaints that I found were regarding the overall materials used to assemble the toaster oven, and the touch-safety of the exterior. I couldnt confirm the first complaint as a design flaw consistent to the whole product line. The second issue regarding the ovens temperature might be a safety matter for homes with small children. This seems to be a solidly designed product. If you buy it on sale, it offers good value for your consumer dollars without using up a lot of valuable kitchen space. The consistency of cooking makes this a little oven with BIG potential. Amazon currently has this toaster oven at 54% off.